Modern reenactment of Mongol military movement. Genghis Khan organized the Mongol soldiers into groups based on the decimal system. Units, which included all males from 14-60, were recursively built from groups of 10 (Arav), 100 (Zuut), 1,000 (Minghan), and 10,000 (Tumen), each with a leader reporting to the next higher level. These units were overseen by the tumen quartermaster, called the jurtchi. Genghis Khan rewarded with command postings those who had been loyal to him during the lean years of his rise to power. Tumens, and sometimes Minghans, were commanded by a Noyan, who was often given the task to administer specific conquered territories. From two to five Tumens would then form an ordu meaning army corps or field army, from which the word "Horde" is derived, under the command of the Khans or their generals (boyan). An ordu was a tightly regulated unit and its organization an layout were uniform. Transfers between units were forbidden. The leaders on each level had significant license to execute their orders in the way they considered best. This command structure proved to be highly flexible and allowed the Mongol army to attack en masse, divide into somewhat smaller groups to encircle and lead enemies into an ambush, or divide into small groups of 10 to mop up a fleeing and broken army. Individual soldiers were responsible for their equipment, weapons and up to five mounts; though, they fought as part of a unit. Their families and herds would accompany them on foreign expeditions. Above all units, there existed an elite force called keshig. They functioned as imperial guard of the Mongol Empire. When integrating new soldiers into the army, Genghis divided the soldiers under different leaders to break up the social and tribal connections, so there was no division based on heritage of tribal alliances. Thus, he helped to unite several disparate peoples and gave them new loyalties to each other. However, old tribal identities did not completely disappear, and those tribes who had remained loyal to him throughout the hard years retained some integrity and sense of continued identity, whereas the Tatars, Mergids, Keraits, Naimans and other former enemy clans were more forcefully and thoroughly broken up. Hence there existed examples of Ongut tumen but never Tatar tumen. Drawing of a mobile Mongol soldier with bow and arrow wearing deel. The right arm is semi-naked because of the hot weather. Each Mongol soldier typically maintained 3 or 4 horses. Changing horses often allowed them to travel at high speed for days without stopping or wearing out the animals. Their ability to live off the land, and in extreme situations off their animals (mare's milk especially), made their armies far less dependent on the traditional logistical apparatus of agrarian armies. In some cases, as during the invasion of Hungary in early 1241, they covered up to 100 miles per day, which was unheard of by other armies of the time. Mongol cavalry archery from Rashid-al-Din Hamadani's Universal History using the Mongol bow. 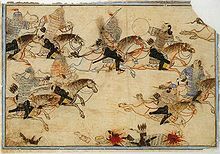 Six of every ten Mongol troopers were light cavalry horse archers, the remaining four were more heavily armored and armed lancers. Mongol light cavalry were extremely light troops compared to contemporary standards, allowing them to execute tactics and maneuvers that would have been impractical for a heavier enemy (such as European knights). Most of the remaining troops were heavier cavalry with lances for close combat after the archers had brought the enemy into disarray. All soldiers usually carried scimitars or axes as well. The Mongols protected their horses in the same way as did they themselves, covering them with lamellar armor. Horse armor was divided into five parts and designed to protect every part of the horse, including the forehead, which had a specially crafted plate which was tied on each side of the neck. A Mongol melee in the 13th century. The basic costume of the Mongol fighting man consisted of a heavy coat fastened at the waist by a leather belt. From the belt would hang his sword, dagger, and possibly an axe. This long robe-like coat would double over, left breast over right, and be secured with a button a few inches below the right armpit. The coat lined with fur. Underneath the coat, a shirt-like undergarment with long, wide sleeves was commonly worn. Silk and metallic thread were increasingly used. The Mongols wore protective heavy silk undershirts. Even if an arrow pierced their mail or leather outer garment, the arrowhead was unlikely to completely pierce the silk, thus preventing an arrow from causing deadly harm. The boots were made from felt and leather and though heavy would be comfortable and wide enough to accommodate the trousers tucked in before lacing tightly. They were heelless, though, the soles were thick and lined with fur. Worn with felt socks, the feet were unlikely to get cold. Lamellar armor was worn over the thick coat. The armor was composed of small scales of iron, chain mail, or hard leather sewn together with leather tongs and could weigh 10 kilograms if made of leather alone and more if the cuirass was made of metal scales. The leather was first softened by boiling and then coated in a crude lacquer made from pich, which rendered it waterproof. Sometimes the soldier's heavy coat was simply reinforced with metal plates. Helmets were cone shaped and composed of iron or steel plates of different sizes and included iron-plated neck guards. The Mongol cap was conical in shape and made of quilted material with a large turned-up brim, reversible in winter, and earmuffs. Whether a soldiers helmet was leather or metal depended on his rank and wealth. Mongol soldiers using bow, in Jami al-Tawarikh by Rashid al-Din, 1305'1306. The primary weapon of the Mongol forces was the Mongol bow. It was a recurve bow made from composite materials (wood, horn, and sinew), and at the time unmatched for accuracy, force, and reach. The bow's geometry allowed it to be made relatively small so it could be used and fired in any direction from horseback. Quivers containing sixty arrows were strapped to the backs of the cavalrymen. The Mongols were extremely skilled with the bow and were said to be able to hit a bird on the wing. The key to the strength of the Mongolian bow was its laminate construction, with layers of boiled horn and sinew to augment the wood. The layer of horn was in the inner face as it resists compression, while the layer of sinew was at the outer face as it resists expansion. All of this gave the bow great power which made it very good against armour. The Mongol bow could shoot an arrow over half a kilometer. Targeted shots were possible at a range of 200 or 230 m, which determined the optimal tactical approach distance for light cavalry units. Ballistic shots could hit enemy units (without targeting individual soldiers) at distances of up to 400 m, useful for surprising and scaring troops and horses before beginning the actual attack. Mongol archers used a wide variety of arrows, depending on the target and distance. Maille and metal armour could be penetrated at close range by using special heavy arrows. Technology was one of the important facets of Mongolian warfare. For instance, siege machines were an important part of Genghis Khan's warfare, especially in attacking fortified cities. The siege engines were disassembled and carried by horses to be rebuilt at the site of the battle. The Mongol battlefield tactics were a combination of masterful training with excellent communication and discipline in the chaos of combat. They trained for virtually every possibility, so when it occurred, they could react accordingly. Unlike many of their foes, the Mongols also protected their ranking officers well. Their training and discipline allowed them to fight without the need for constant supervision or rallying, which often placed commanders in dangerous positions. Drawing of Mongols outside Vladimir presumably demanding submission before its sacking. The Mongols used psychological warfare successfully in many of their battles, especially in terms of spreading terror and fear to towns and cities. They often offered an opportunity for the enemy to surrender and pay tribute, instead of having their city ransacked and destroyed. They knew that sedentary populations were not free to flee danger as were nomad populations, and that the destruction of their cities was the worst loss a sedentary population could experience. When cities accepted the offer, they were spared, but were of course required to support the conquering Mongol army with manpower, supplies, and other services. In all battlefield situations, the troops would be divided into separate formations of 10, 100, 1,000 or 10,000 depending on the requirements. If the troop split from the main force is significant like 10,000 or more they would be handled over to a significant or second in command leader while the main leader concentrates on the front line. The leader of the Mongols would generally give the tactics used to attack the enemy. For instance the leader might say when seeing a city or town, "500 to the left and 500 to the right" of the city and those would be relayed to the 5 units of 100 soldiers and they would try to flank or encircle the town to the left and right. ^ a b Morris, Rossabi (October 1994). "All the Khan's Horses" (PDF). pp. 2. http://afe.easia.columbia.edu/mongols/conquests/khans_horses.pdf. Retrieved 2007-11-21. Conn Iggulden., -- Genghis, birth of an empire,Bantham Dell.